Often, lintel support is insufficient; whether this is due to general deterioration of the building over time, the existing mild steel lintels starting to rust and corrode, or due to settlement and movement. 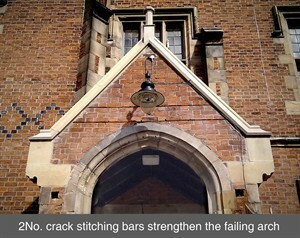 Signs of lintel and brick arch failure becomes evident; typical signs are diagonal or stepped cracking at the tops of windows or doors. When cavity walls were first introduced, it was common practice to construct the outer leaf of the cavity without a lintel reinforcement, with the brickwork supported by the load bearing window frame. Often, especially when windows have been replaced, the lintels start to sag, or diagonal cracks (almost into a triangle) start to appear at the corners of windows. This is because, in this instance, the original timber windows were helping to support the outer masonry skin. Once replaced, the new windows had insufficient load bearing capacity, causing the masonry to crack. Left unchecked, the cracks in the wall are liable to worsen. Here at Stronghold Preservation we offer the service of essentially creating a new lintel over your existing opening with minimum disturbance. This is suitable for most lintel failures and failed masonry arches. This method of forming lintels costs significantly less than traditional lintel replacement. As the lintels have failed, or are non-existent, we suggest, in effect, installing new lintels above the existing lintels. Our highly skilled operatives cut two horizontal grooves, 450-900mm vertically apart, above the window. Two pairs of high tensile stainless steel helical bars are embedded into the wall with a specialised grout. The reinforced brick beam lintel has a typical load carrying capacity of 2.6 tonne (BRE Calculations).